BMW describes the new 4 Series Gran Coupé as follows; “combines the sleek look of a two-door coupé with the functionality provided by four-doors and expansive spaciousness, including a wide-access luggage compartment” – that pretty-much describes the car in a nutshell. There aren’t many (any?) people that would put the picture of a 4-door vehicle up on their wall to drool over, but a supercar or a coupe…that’s a different story. BMW are providing the beautifully designed coupe worth drooling over, but adding 3 more doors for practical purposes… for people that WANT a coupe, but NEED a 4-door sedan/hatchback…the Gran Coupé… not to be confused with the 3 series Grand Turismo (GT) which is exactly the same, but different. 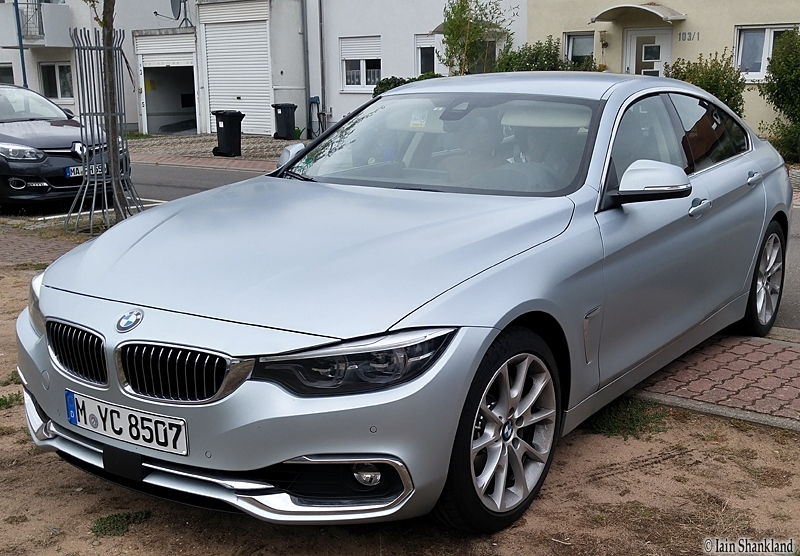 I LOVE the look of the Gran Coupé and with the attention and thumbs up we received over the 10 days, it’s obviously a stand-out in a sea of BMW’s. My wife even caught two guys drooling over it at the Hockenheimring! 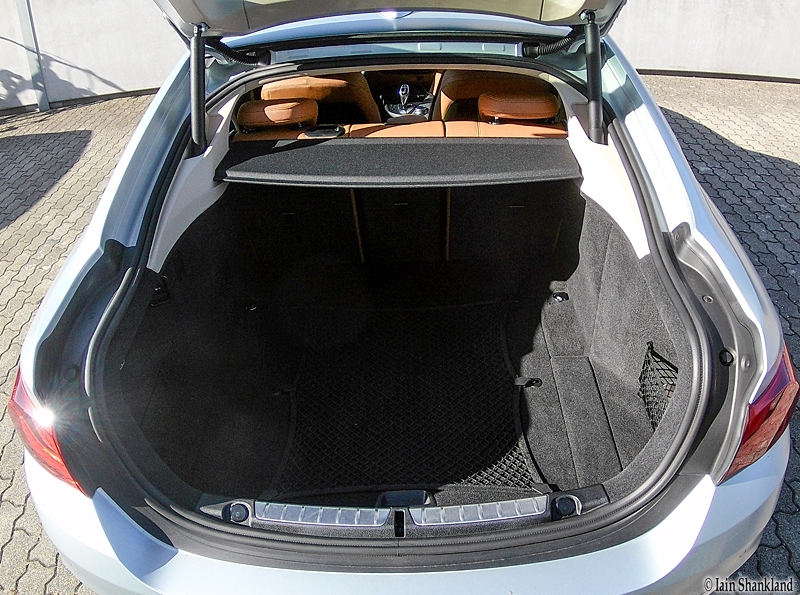 The trunk is an acceptable size with a low liftover, but the usability is not acceptable for large suitcases, which is the big downside to a hatchback vs a touring edition. Bury the throttle, start counting 1-2-3-4-5-6 GO!! When it finally decides to move – it goes… but it’s less than confidence inspiring when you pull out to overtake and the gap between you and the vehicle coming at you from behind is getting smaller and smaller and the car hasn’t even down-shifted yet! This is a little secret that BMW should be yelling about from the rooftops – it’s incredible!!! It starts off with the actual design of the car – lightweight construction and honed aerodynamics with features such as a smooth covered underbody and the use of Air Curtains and Air Breathers. Brake Energy Regeneration, the Auto Start Stop function, the gear shift indicator and ancillary components that are activated on-demand also contribute to fuel savings and reduced emissions. 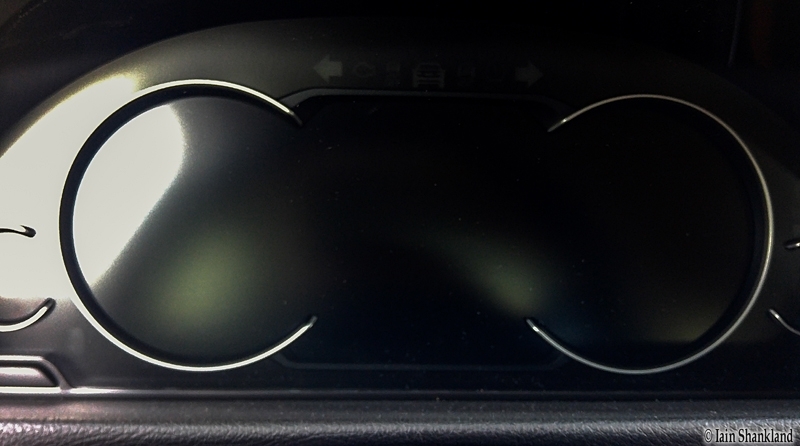 The Pièce de Résistance is the Steptronic Automatic transmission – with coasting mode and with the ECO PRO mode! This stretches your fuel economy into Hybrid/EV territory – with no downside. We were in Königswinter with our destination 62 kilometres away and we had 82 kilometres of fuel in the tank. I switched on the ECO PRO mode to see what would happen. In the dash there is a little green picture of a foot on the gas pedal and every so often it’ll pop up with a green arrow point up – telling you to ease up on the gas pedal. We got to our destination with 52 kilometres of fuel left in the tank!! So we travelled 62 kilometres, but only used 30 kilometres of fuel. I didn’t change my driving habits any more than coasting up to lights. We had more than enough gas in the car to get us back to the airport with probably 200+ kms of fuel left in the tank. What we didn’t account for was our friend (a race car driver – formerly with BMW Alpina) taking us to a football game and him driving the car there. We had a blast on the trip, but he burned through the spare 200 kms of fuel on our 80 km trip!! We had to get to the airport at 5am and travel a distance of 99 kilometres and we had enough fuel for 134 kms. That’s a little too close for my liking, but we went for it. Switching the car to full ECO PRO mode we set off. Just following the little green light and easing up on the throttle, we’d travelled 45 kilometres before the distance to empty dropped below 134 kilometres and stayed there (it went up and down as we drove along). I drove at regular speeds – 120-130 km/h on the autobahn and the total trip was 3 minutes longer than projected in the navigation before we left the hotel. That 3 minutes could easily have been added due to the traffic we encountered, still we arrived at the airport with…. 105 kilometres of fuel in the tank!! We essentially drove 100 kilometres and used only 29 kilometres of fuel – while travelling at 120-130 km/h!!! The entire range of BMW ConnectedDrive options can be ordered for the BMW 4 Series Gran Coupé. 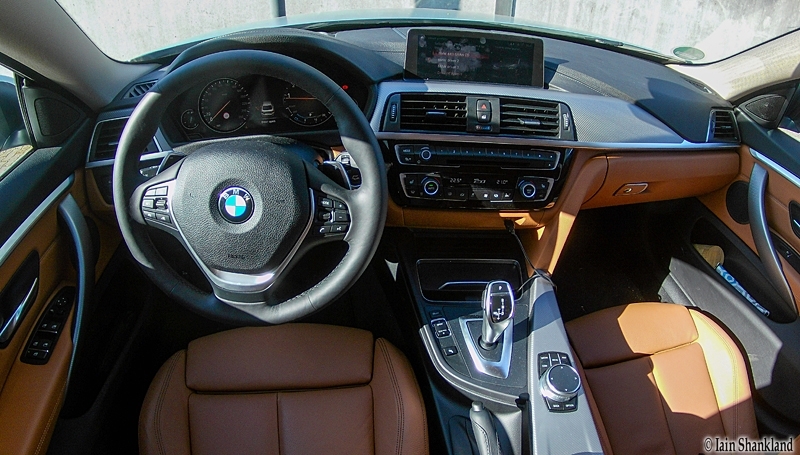 Among the highlights are the Navigation System Professional, the full-color BMW Head-Up Display, Driving Assistant, the glare-free High Beam Assistant, Active Protection and the latest development stage of the Active Cruise Control with Stop & Go function. 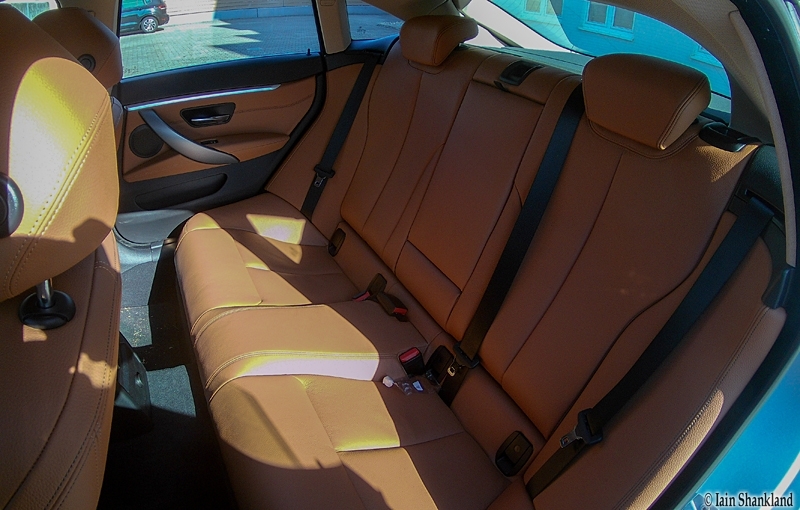 Innovative interface technology also permits easy integration of smartphones in the vehicles. 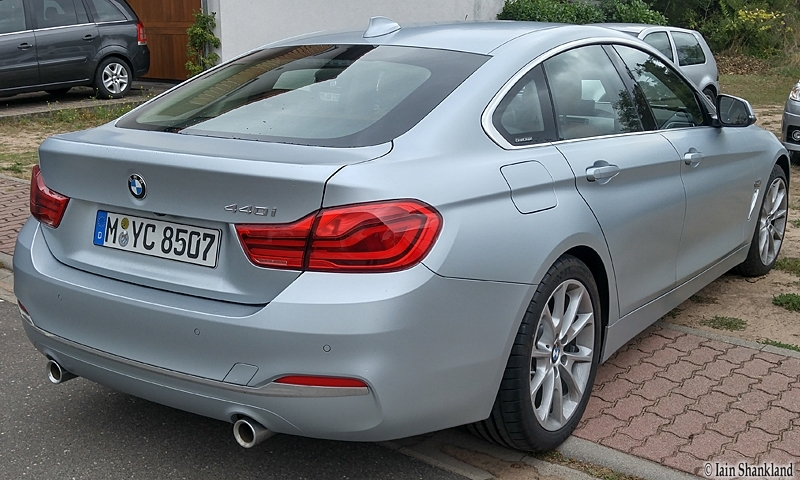 The 4 Series Gran Coupé is a more practical, better-looking version of the 3 Series sedan. Its coupé -like design has more interior room and more cargo room than the 3, and it’s all packaged in a smooth, sleek hatchback body – the best of all worlds really. Leaving the drive mode in Auto makes sense 95% of the time – unless you need to overtake, where it often scares the crap out of you while it uses an hourglass to decide to giddy up and go. Putting it in ECO PRO mode turns it into a game of how-far-can-I-go-on-a-tank – with no downside to performance or speed. I loved the 440i Gran Coupé and for the price, it’s as good as it gets. 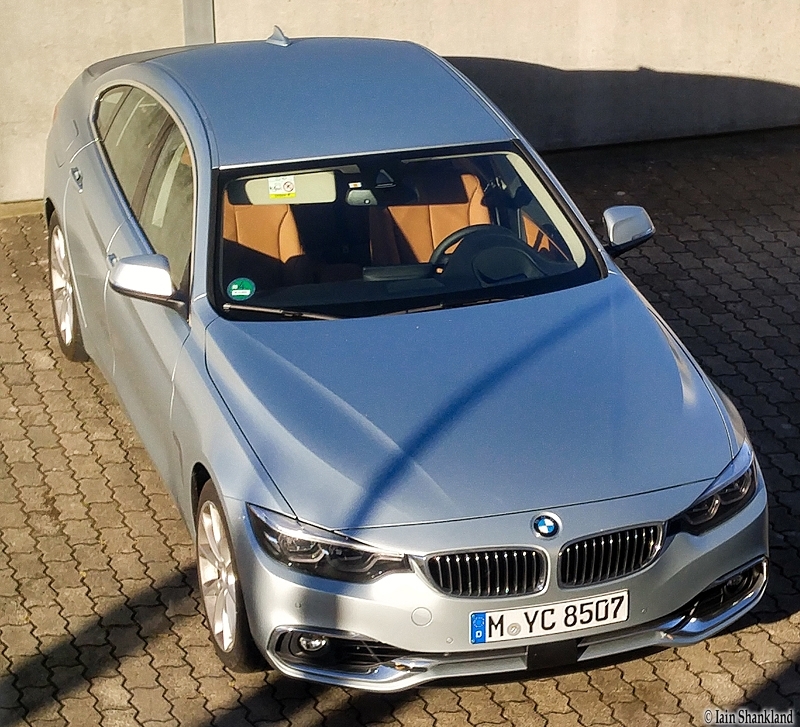 This entry was posted in BMW and tagged #autoblog, #autonews, #GranCoupé, @BMWcanada, Automotive, BMW, cars, mid-size luxury, Road Test, Test Drive. Bookmark the permalink.